The above image was taken February 28, the day after my 50th birthday February 27,2009. The gift from my husband was a morning at the hair salon getting pampered and then shopping and dinner in the city. My name is Sandra Beasley. My nickname "Sam" was derived from "Sham" when my cousin was just learning to talk. I'm in my early 50's, married, chose never to have (human) children, and unemployed by choice. Animals, my pets, the wild things, flora, and fauna, are the center of my life. I call myself a full-time pet keeper and one of the reasons I quit working over 17 years ago was to take care of my menagerie. Even now, I still feel compelled to see the things that go on around me. I still see the butterfly, the bumble bee, stop to smell the flowers, admire a budding tree, roll over a log or rock to see what lives there, and check out ponds to see what dwells there. I was born and raised for all but 7 years of my youth and into my early 20's in Courtenay, on Vancouver Island, B.C., Canada. I now reside In Moose Jaw, Saskatchewan, Canada. Those 7 years were spent in Prince George, B.C. Here in Moose Jaw, my husband worked at 15 Wing Air Force Base with the Snowbirds. On October 08,2003 Alic retired from the Service and worked for Westcan, a bulk transport company for a couple of years as a truck washer, among other tasks. On February 09,2006, Alic resigned from Westcan due to job dissatisfaction, obtained his A-1 driver's licence and now works in seasonal transport hauling various materials across three Provinces and just across the border into the States, presently working for D.J Knoll Transport Ltd.
As a teenager I dabbled in Watkins, Amway, and Shaklee. All adventures were short term because, a distibutor, I am not. I will always maintain that the products are good but these are Multi-Level Marketing companies, otherwise known as pyramid schemes. In Grade 11, our Guitar Teacher helped 4 of his students form a band. I was the lead female vocal. The band, called "Rick's Angels", was made up of three women and one man. We worked together for a couple of years, but Rick's arrogance and jealousy (people were requesting my songs and very few of his) was going to put an end to it all. I was uncomfortable with his choice of gigs, and with some of the songs he chose to sing. I was getting sick and tired of singing in cigarette smoke-laden rooms. And then there was my own blossoming stage fright. I walked away from the whole thing, when Rick gave me an ultimatum. Later, in my early 20's, I auditioned for the position of lead female vocal for a local band called "Alberni Draw", from Cumberland B.C. The band was named for the admiration of a local hero named "Ginger" Goodwin. Ginger is buried in the Cumberland Cemetary and I visited his gravesite, contemplating this man's life, and getting a feel for what this band was all about. Alberni Draw was together for a couple of years. We had many practices together, enoying each other's friendship, and a gig at a coffee shop. This is where I met my future husband, he was the sound man for the band. Nellie Elizabeth Devine, was born in Fort Langley, BC, to Charles ( - ) and Mary (1878 - 1973) Devine. After Charlie died, Mary went on to marry Alexander Houston (1869 - 1950), son of James Houston (1823 - 1902). Nell took her stepfather's last name. 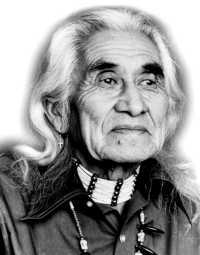 James is credited for being the first white man to find gold in B.C. Nell and Ed were married in 1930 and enjoyed 70 years together. I have always had a menagerie of pets, from the time I was 6 years old, and started with a Parakeet named Cheeko. These pets included both wild caught and domestic critters. Ocean life, pond life, fish, amphibians, reptiles, bugs, birds, rodents, cats, dogs, a horse, and, of course, RATS!, which is what this website is all about. I had never planned on getting married. My life's dream was to live as a hermit, with all of my animals as my sole companions. Reality stepped in, and I married my soulmate, an airforce man. Our first posting, just a year after we were married, took us from our home province of British Columbia, to the province of Alberta, Canada. We lived there, in Cold Lake, for 10 years. Alberta is the Canadian province that prides itself in being "Rat Free", (yeah, right!) where being caught with a pet rat lands you a hefty fine of $5000.00 and your pet being destroyed. Our second and last posting brought us here to Moose Jaw, Saskatchewan in the fall of 1997, where I saw a rat in a pet store for the first time in my life. That was Willow, a little pussywillow-gray female, who was born Oct. 08,1997 and died just one year later, on her birthday. I have had many more ratties since then, learning more and more about them as time went by. Willow had shown me what wonderful companions rats can be. I am not a veterinarian, but I enjoy researching veterinary medicine. I also enjoy human medicine and my television viewing reflects these two interests. I have never been trained officially as a Vet. Tech., but I was given some of the responsibilities of a Vet. Tech. while working for a veterinarian at the Comox Valley Animal Hospital. Dr. Scott's son married one of my cousins, so we got to know each other pretty well. I worked for Dr. Scott for three summers during my High School years. This experience has given me an edge and even now, the veterinarians who look after my pets see me as a client who knows more then the average pet keeper, and they treat me accordingly. I have a need for in-depth details in the care of my animals. 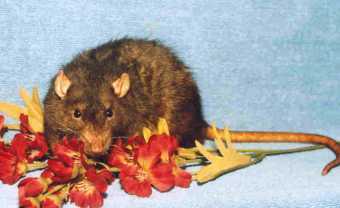 I have been using complimentary medicine for my cats and dogs since 1994 and starting in the early part of 1999 I have been using complimentary medicine for my rats. My only formal education in this field is having successfully completed a course in "Basic Homeopathy" through Maison Naturelle International out of Alberta, so now I proudly display this one certificate on my Pet Room wall. The vast majority of my knowledge is self-taught and comes from my own ever-growing library of complimentary medical books for humans and pets, my local public library, the internet, my own research and observation skills, my own experiences, the knowledge of professionals, and the experiences of my friends on the various rat, pet, and holistic forums that I belong to. It basically started when my 13 year old cat died of Chronic Renal Failure in 1994. I was very distraught over her death, wishing I had taken more responsibility in her medical care instead of leaving everything in the hands of the vets. But what more could I have done for her? That's when I started looking into the Holistic care of cats and dogs. Then years later I was able to put my new-found knowledge to use and watch it work. First, there was Sandy, my one and only horse. He's the one who kept me sane during my teenage years. He was either a Bulldog Quarter Horse or a Quarter Horse/ Draft Breed Cross. Purchased as a 3 year old gelding, he turned out to be a 2 year old stallion (long and embarrassing story). Shaklee Food supplements saved Sandy's life when, at the age of 6, a crippling disease called Founder should have warranted his death, or at the very least, would have left his hooves and legs permanently damaged beyond the ability to be ridden. My vet didn't know what else to do for him, and my Ferrier was going to go to the extreme measure of removing the front part of his hoof to relieve pain and pressure. It took almost a full year for Sandy to recover from this illness, but we did go on to ride the wind again, for another 20 years. Sandy was euthanized at the age of 26, when a second bout of founder proved to be too much for him to bear. Then there was Jason, my English Cocker Spaniel. Jason lived to 16 1/2 years old with Glucosamine Sulfate and Rhus Toxicodendron (Rhus. Tox.) controlling his Spondylosis. Sudden complications due to a septic condition finally forced us to have Jason euthanized. RIP Jay Jay - December 07,1999. Cagney, was my Working Border Collie/ Australian Cattle Dog mix. Cagney was just a good ol' boy, often mistaken for a Canaan Dog or a Karelian Bear Dog. At one time Cagney and I were invited to join Super Dogs, but for personal reasons I had to decline the offer. At 12 years old Cagney was diagnosed with Fibroblastic Osteosarcoma (an inoperable nasel tumor), and he was sent home to live out his prognosis of 2 months. Conventional medicine could do nothing more for him. With the help of a raw diet developed by Dr. Marlene Smith, and complimentary medicine, Cagney had 2 more years of quality life with us. Cagney declined rapidly in the last 3 weeks of his life, and on his last day, when he *told* us that he had to go to the Bridge, we took him to the vet to be euthanized. RIP Caggle - July 20,2000. In each of these cases my veterinarians could only control the symptoms of the animals' diseases with the practice of well-known western medicine. When they could do more for my pets, complimentary medicine took over and gave each animal a longer, more comfortable life, by healing the body as a whole. Aside from my responsibility as a care-giver to a number of pets, I spend many hours a day in front of the computer. I'm usually reading the e-mail from the Ratlist and other rat/mouse/all-pet/-related forums too numerous to mention, sorting and printing off e-mail that I want to keep for future reference, or working on my website. Some years ago I founded and maintain three "Clubs" for other rat-lovers' rats. These are: The "Monthly Angels", The "Over 2 Club", and The "Over 2 Club for the Dearly Departed"
I was born February 27. I'm a Pisces. I typed in both "Sandra Lynne Shields", my maiden name, and "Sandra Lynne Beasley", my married name. Oddly enough my married name gives me a better representation of how I see myself. The North American Indians use Medicine Wheels to determine your Animal Totem and I have both the wolf and the cougar spirit within my soul. I have always felt a close relationship with the wolf, and the cougar. Maybe that's why I have this fascination with feral children, and human/animal metamorphasis, like the werewolf. I don't think I have missed too many movies or novels relating to these subjects. I work as a volunteer for the Moose Jaw Humane Society. I am a member of their "Paws for Coffee" auxillary group where I help with Garage Sale sorts, the set ups days ahead, and the two Garage Sales per year. I help with the Dog Jogs, Bone-anzas, Envelope stuffing, Guest Speaker Committee, Santa Paws Parties, Parades, Mall sittings, Pet Therapy and Pet Education. I have found over the years that the Humane Society puts forth a warm welcome, an appreciation, and respect for it's volunteers. I only live a short walk from the facility. Check out The Humane Society of Canada to find a Humane Society near you in Canada. I volunteer as a Pet Sitter, for "Mr. Sitter's Pet Sitting Service" on a *very* casual basis, I think? It used to be that when my employer needs to leave town for any period of time, I would look after her pets as well as take on any jobs that come up during her absence. In return my pets are looked after for free when I need a pet sitter. It's been a very long time since I've been called that it appears that I'm no longer needed. I have another pet-sitter who loves to look after my rats, and I don't mind paying her. I was a member of the Band City Kennel & Obedience Club from 1997 to 2008. The last four years were pure hell in that club, and since quitting I will not recommend it to anyone. Living in Cold Lake I had (and still have) a friend who is a Dog Groomer. Jody would ask for my help and my company with some of her clients, so I learned a bit about grooming. Jody has since moved to another part of Alberta, and is the owner of BearyTiny Kennels. I founded and precided over the Moose Jaw Feline Fanciers in 2000. I closed the account in November 2005, officially declaring this club dead, but I'm still here for people who want to talk cats. My cats are registered with four cat associations/clubs, I use to be the Western Director for one of them, the International Mitten Cat Association, but it's been so many years since I've heard anything from anyone, I'm thinking that the association has died. 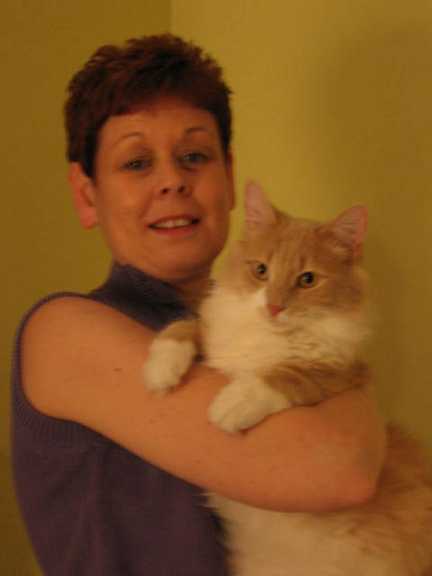 I showed my Household Pet Cats in Cat Shows starting in 1994, first under TICA rules, later under SHPCA rules, and during this time we were also earning points for ribbons and titles from Happy Household Pet Cat Club, and The International Mitten Cat Association. I have stopped showing Charma, because there's no more room on the walls of my Pet Room for her extensive rosette collection. I was looking forward to starting my youngest, Devin, in shows, but it looks like that will never happen as there are no shows in my area and my interests have changed. I haven't shown cats since 2000. While my husband was working at WestCan I had joined a spouses' group called WOW, Women of WestCan. Though sad to leave this group, I found with my deep interest in animals, that I never really fit in anyway. Garfield the Cat cartoon books. I have books #1 through #40. And, I LOVE to shop for my pets!!!! My favorite Pet Stores here in Moose Jaw are "PAWS4Purrfection" (formerly Bray's) and "DDK Pets and Points". In Regina (45 minutes from where I live) I shop at Cowtown, Petland, Petsmart and Petcetera. --- Arrogance, as in referring to oneself as King or Queen of something. --- Anything that goes wrong with my computer and it's componants, because I'm still computer illiterate. --- Being around people for any length of time. People wear me out. I prefer to be alone. --- Constricting clothing. I prefer baggy clothing like fleece sets. --- Driving. Gosh, I HATE driving! I only drive when I have to, and then it's by the book, and by the way my driving instructor taught me. --- By the same token, I hate bad drivers. You know the ones, tailgaters, speeders, traffic light runners, impatient yahoos behind the wheel. --- Retailers that don't stand behind the products they sale. --- "Fighting" with inanimate objects, ie. looking for that pen at the bottom of my purse. --- Being in situations that give off negative vibes. --- Clubs and Associations that do not respect or appreciate it's volunteer members. --- Foods: French Fries, Submarine Sandwiches, Hamburgers. --- Sayings: "Get over it", "Live with it". "I will not stay where I am not wanted or needed"
"Nothing is ever as easy as it first appears to be"
Favorite Movies: When it comes to movies I can watch and enjoy pretty much anything. I like comedy, drama, action, tear-jerkers, spoofs, sci-fi, horror, fantasy, animation, and the occasional classic ("My Fair Lady" [Audrey Hepburn] and "The King and I" [Yul Brynner] come to mind). I don't make it a habit to watch biographies, but occasionally a good one comes up. What I really hate is slasher movies. You know the ones: Nightmare on Elm Street, Friday the Thirteenth, Halloween, Candy Man, etc....Uh, except when it comes to my werewolf movies. Favorite Actors: In no particular order....Kevin Sorbo, Keith Hamilton Cobb, Susan Sarandon, Geena Davis, Jessica Lange, Sigourney Weaver, Marc Singer, Demi Moore, Richard Gere, Charlie Sheen, Robin Williams, Mel Gibson, Rosie O'Donnell, Ron Perlman, Linda Hamilton, James Woods, James Marsters, Jeff Goldblaum, Jim Carrey, Jim Varney, Patrick Stewart, William Shatner, Leslie Neilson, Julia Roberts, Tom Cruise, Tom Hanks, Daryl Hannah, Sandra Bullock, Carol Burnett, Kevin Costner, Alan Alda, Harrison Ford, Eddie Murphy, Val Kilmer, Nicholas Cage, Adrian Paul, Arnold Schwarzeneggar, Christopher Reeve, Christopher Lambert, Charlton Heston, Richard Dreyfess, Elizabeth Hurley, Pierce Brosnan, Jeff Bridges, Karen Allen, Jeremy Irons, Kiefer Sutherland, Leonard Nimoy, James Coburn, Mel Brooks, John Saxon, Tony Curtis, Sean Connery, Jean Wilder, Madeline Kahn, Cloris Leachman, Teri Garr, Goldie Hawn, Kurt Russell, Roddy McDowall, Drew Barrymore, Lou Diamond Phillips, Micheal Keaton, Will Smith, Donald Sutherland, Elizabeth Montgomery, Barbara Eden, Audrey Hepburn, Yul Brynner, Bette Midler, Jack Palance, Brendan Fraser,Tommy Lee Jones, David Bowie, Peter O'Toole, Sissy Spacek, Winona Ryder, William Hurt, John Lithgow, Carlo Rota, Mathew Broderick, Rutger Hauer, Michelle Pfeiffer, Roy Schnieder, Johnny Depp, Cher, Jerry Lewis, Rowan Atkinson (Mr. Bean), John Corbett, Robert Patrick, Brad Pitt, Kirstie Alley, Jeff Fahey, Bruce Campbell, Orlando Bloom, Meryl Streep, Gordon Tootoosis....mmmmm, did I miss anybody?. Kathleen E. Woodiwiss Romance Novelist. Jean M. Auel Author of the "Clan of the Cave Bear" and "Earth Children" series. Edgar Rice Burroughs Author of the "Tarzan", "Mars", and "Venus" series, among other works. Favorite music is from the 50's, 60's, and 70's. I grew up in the heart of Disco. Music during the 80's and the first part of the 90's was good too, but after that I just lost interest in purposely listening to music. Lately I've been finding that I really like Rap. Favorite clothes: Bluejeans and sweats. Favorite jewlery: Anything, as long as it's not expensive. Gems and gold do nothing for me....One exception, my wedding ring. Favorite colors: Shades of blue, shades of burgundy/rose, shades of grey. Favorite computer games: FreeCell, Solitaire, Mah-Jong. Favorite Foods: My own recipe for Greek Salad, my own recipe for Manhatten Clam Chowder, my own recipe for Green Pea Soup, my own recipe for Cream of Mushroom Soup, Joey's Only fish n'chips, Manchu Wok - chinese food.....Is Coke Classic a food? Wilton Industries got me interested in candy making. I used to enjoy Cross Stitch, but that was put aside when Cagney was diagnosed with cancer, and we were pre-computer. Maybe I'll get back to these hobbies of candy making and cross stitch when I get tired of keeping rats....HAH! I have been an un-baptized student of Jehovah's Witnesses since 1986. Un-baptized because I cannot fully absorb and appreciate some of the beliefs put in front of me. Because I am so earth bound and lean more towards animals and the healing powers of nature for my daily comfort, my spirituality leans more towards Wicca. International Mitten Cat Association (IMCA) - No Web Site - ??????? Fun Cat Stuff - Music, graphics, animation, etc. CKC's Canine Good Neighbour Test - Canada's CKC had just made this test available in Saskatchewan when my dog Stoan achieved the title of "CGN" in April 2002. CKC took the name of "Canine Good Neighbour" from the USA's "Canine Good Citizen" test and the programs are the same. NK Concepts - Training etc. Natural Dog Training -- What is natural dog training? The Origin of the Domestic Dog -- Where did our pets come from? Training With a Prong Collar -- Cruel tool, or practical application? 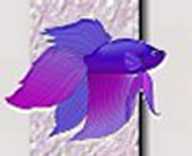 Where did our Modern Betta Come From? In memory of "Bart the Bear" who starred in such movies as "Clan of the Cave Bear" and "The Bear"
Global Warming - The Earth is heating up. What one fears, one destroys." What is it that moves me so, when I see a wolf or a wolfdog in person? Is it the awesome spirit of the wolf, their beauty, or their all-knowing eyes, that causes me to overflow with emotion? Emotions that literally take my breath away and make my eyes brim with tears. "Spiritual therianthropes are individuals who feel a deep connection with one or more animals, or sees aspects of animals manifest in his/her behavior and personality. Many therianthropes believe that an animal spirit is an integeral aspect of their being". 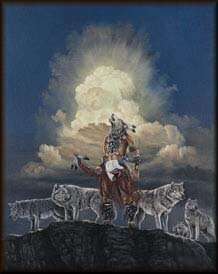 I am spiritually connected to the wolf. St. Francis - who was he? All Canada Links Over 80,000 links to Province, City, News, Sports, Weather, Government, etc. Canada and United States Travel Highway Conditions, Weather, Airport Conditions, etc. An Altavista Search brought up the following sites that have linked my site. Please visit them as a thank you for me. An AOL Search brought up the following sites that have linked my site. Please visit them as a thank you for me. A Google Search brought up the following sites that have linked my site. Please visit them as a thank you for me. An MSN Search brought up the following sites that have linked my site. Please visit them as a thank you for me. A Netscape Search brought up the following sites that have linked my site. Please visit them as a thank you for me. A Ask.com Search brought up the following sites that have linked my site. Please visit them as a thank you for me. A Yahoo Search brought up the following sites that have linked my site. Please visit them as a thank you for me. A Sympatico.ca Search brought up the following sites that have linked my site. Please visit them as a thank you for me.